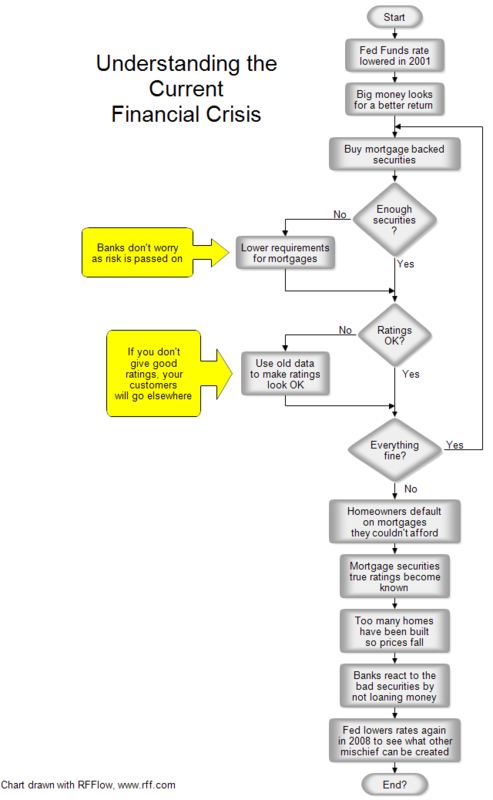 Description This flowchart tries to explain the basic points in the current mortgage crisis. The story is probably an old one. People try to get the maximum return on their money. Big returns have big risk. Investors may not have realized this, but the risk was there. The two yellow boxes in the chart above show where regulation failed. Normally a bank wouldn't give a loan to someone who had no income and no assets and such mortgages combined together should not have a high rating. By elevating these toxic mortgages to triple A an enormous amount of wealth was generated. However, this wealth disappeared when their true value was determined. This will all happen again, but in a different way. Once RFFlow is installed, you can open the above chart in RFFlow by clicking on foreclosure.flo. From there you can zoom in, edit, and print this sample chart. It is often easier to modify an existing chart than to draw it from scratch.